With this example, we'll create a page in our mobile application that displays a list of users with their profile picture and user name. Clicking on the user will navigate the app to the corresponding user profile page. 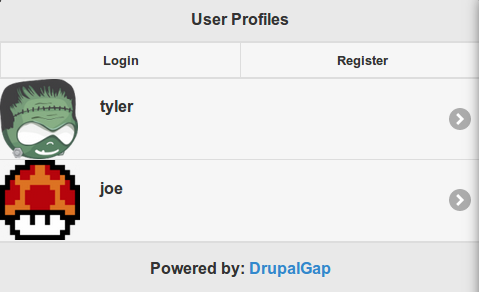 For this example to work, we'll need to check the "Enable user pictures" checkbox under admin/config/people/accounts on our Drupal site. Also, the View user profiles permission needs to be given to both the Anonymous and Authenticated user roles under admin/people/permissions. This example is powered by the Views JSON User List Example. Be sure to have it set up before continuing. * The page callback to display the view my_module_user_profiles. * Callback function for no results. Now if we view our newly created page in the App, we'll see a list of users along with their names, profile pictures and be able to click on them to see their user profile. With this example, we'll create a page in our mobile application that displays a list of articles with their image field and node title. Clicking on the article will navigate the app to the corresponding article node page. 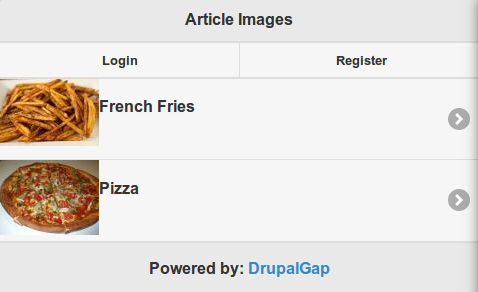 For this example to work, we'll need a few Article nodes created with images under node/add/article on our Drupal site. Also, the "View published content" permission needs to be given to both the Anonymous and Authenticated user roles under admin/people/permissions. * The page callback to display the view my_module_article_images. Now if we view our newly created page in the App, we'll see a list of articles along with their titles, image, and be able to click on them to see the full article node page.